Prepare for VMware Exams With Latest Learning Materials and Real VMware Questions! 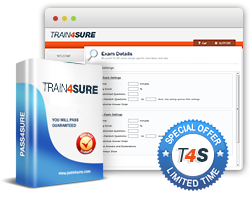 Train4sure is one of the most trusted providers of interactive training materials for IT certification exams, especially when it comes to VMware. We work closely with VMware experts and certified trainers to ensure that our learning solutions are fully based on authentic VMware questions and verified answers. When you purchase VMware learning materials from Train4sure, you can be confident that you will pass your upcoming VMware exams.